Bad news from Yorkshire: A boiler tube sprang a leak and 2807 was declared failed. “Further update from NYMR is the fix looks fine this morning and the loco is cooling after the test yesterday and still has 20lbs on the clock at 9am. So, what went wrong, and is this the start of a trend? Well, we don’t yet know. Much discussion took place at Todders on Weds and subsequently by email. Broadly, the decision was taken to let 2807 carry on with the holey tube plugged until either: another tube goes, or January arrives. … we’ll take the errant tube out and investigate what might have been the cause. 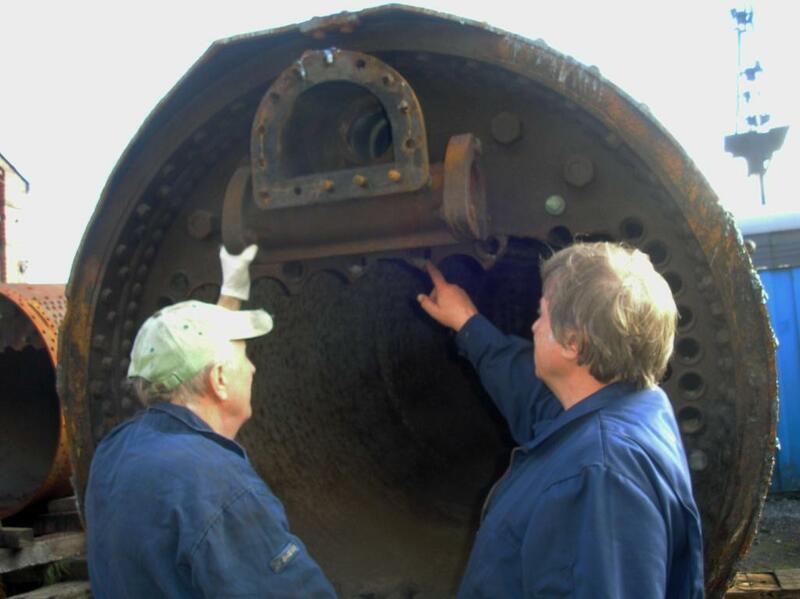 The other tubes will be inspected (as far as is possible through the inspection and mud hole doors). The action then depends upon the recommendation from GWSR’s Boiler Responsible Person (i.e. Carpo). We might just replace the one tube; or we might end up taking 2807 out of service and replacing all tubes. 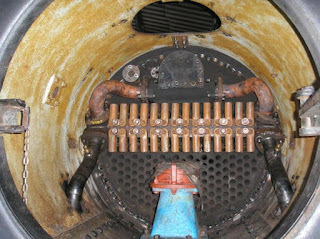 In fact, if it came to the latter, it would in effect become the 10-year overhaul of the boiler. Anyway, at Todders on Wednesday, there was only Bruce and myself. We spent some time discussing the options with Carpo. Apart from that, we changed a 13 amp plug on the compressor for a blue 16 amp plug because the compressor is now in a cabinet outside (as opposed to being inside the 20ft container). We considered how to improve the hinges on the cabinet door. I painted lettering on the boot scrapers in the production line. Then we went home. I nipped down to Todders to fit brushes to the boot scrapers. We then have some ready to re-stock the cafes on Sunday. 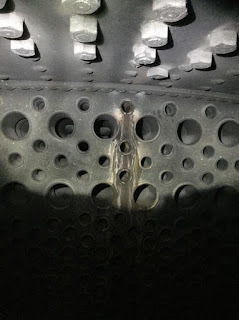 In normal GWR practice a 2" tube is swaged down at the firebox end so that it will fit the 1 13/16" hole in the copper tubeplate. The tube is fed in from the smokebox end and then expanded with suitable tube expanders at both ends. We cannot do this in this instance unless onerously we remove the regulator header. 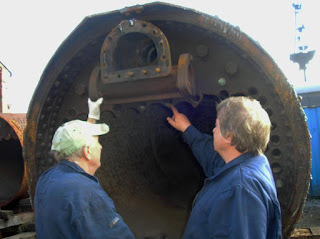 My idea was to obtain a 1 13/16" tube (which is therefore the right size for the firebox end) which when fed into the 2" hole in the smokebox tubeplate should allow us enough wriggle room to feed the tube in without having to remove the regulator header. Once in position there should be enough room to get a suitable expander in to expand the tube at both ends. If we can do it then this will be much the preferred option from safety point of view rather than continuing to run with bungs. I would suggest that once the engine has returned from NYMR we should undertake this work without delay as we are talking about 2 or 3 days work to accomplish the task and then the engine can run on the Santa's to see what happens next (hopefully nothing!). Bruce and John G are discussed how on earth you get the tube in/out without having to remove the regulator header. The tube is not able to be withdrawn - it does not quite clear the bottom of the header. Carpo’s plan is to pull it out as far as it will come and then cut the end off; repeat until all is out! A close eye will be needed to find the leak, and assess what the cause was, without cutting through the leak point. Bruce arrived first (or maybe John T did? ), and was soon ear holed by Nigel BH. Someone had questioned his electrical installation in our container. Nigel was not amused. He confirmed that the installation complies 100% with all appropriate standards, and that none of the equipment that we use in the container requires a 16 amp (blue) plug. John G and I arrived, and we discussed the difficulty of extracting the duff boiler tube. 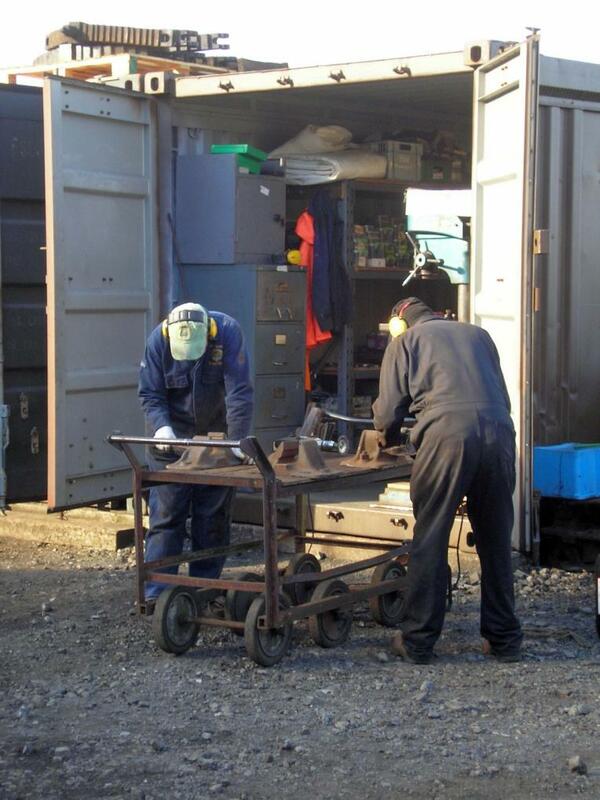 We really don’t want to take out everything in the smokebox. 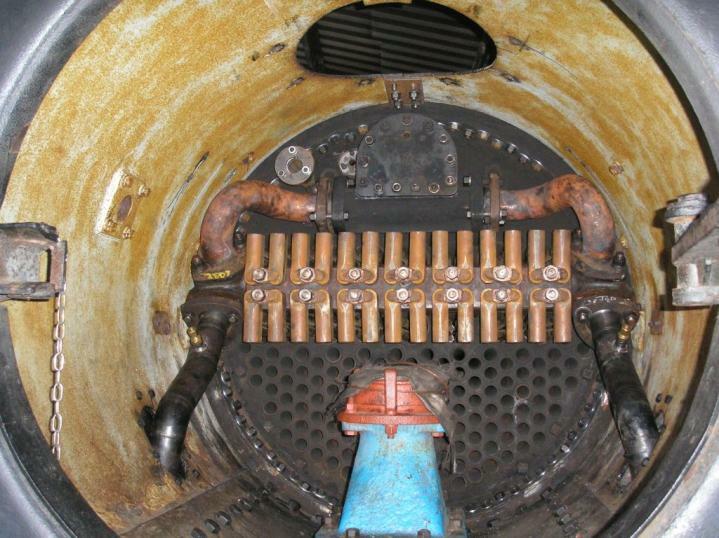 The following photo (from 2010) shows the superheater and the regulator header in position (but note that there is no chimney, petticoat, etc., etc. at this stage of 2807’s rebuild). So, at least one superheater tube will have to be removed, anyway! 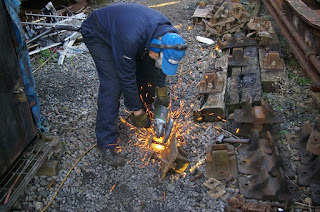 John G decided that he’d be more productive at Winchcombe, working on the siphon van restoration. John T had already got stuck in to needle-gunning rail chairs. Bruce had bought a quality adjustable spanner, which led me to slap a smidgeon of yellow paint on this and the spanners from 2807’s toolbox (just to identify them as ours). At various points, we all joined in the rail chair preparations, though only cleaned five by end of play. Bruce, however, decided that it was time to fix the handle on the pillar drill so that it pointed to the correct picture. 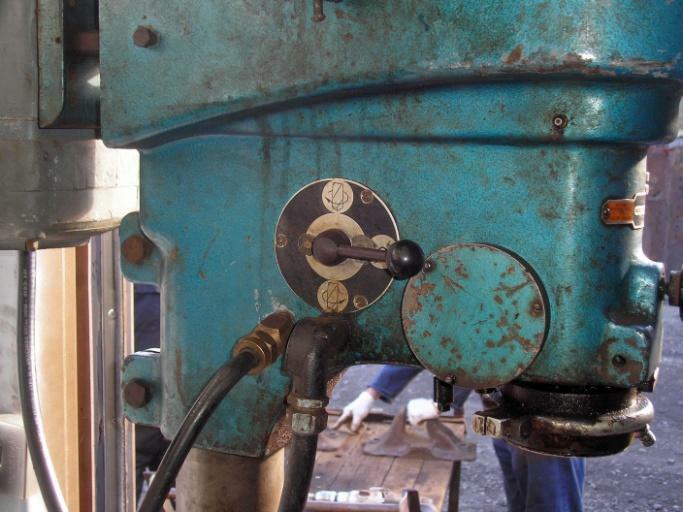 Turning the lever downwards has always caused the drill to rotate clockwise (the right direction for drilling holes! 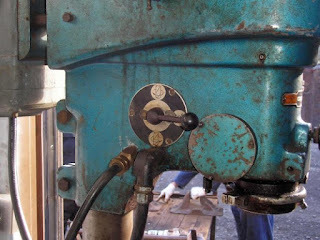 ), but in this position it pointed to the diagram of the drill rotating anti-clockwise (backwards). So, he took the lever and switch apart; fiddled with it; managed to rotate the switch, and reassembled it. The lever now goes upwards to drill holes!